The Madison partnership of Bradley Wiggins and Mark Cavendish continued to take shape during the second night at the Ghent Six, although the pair lost more ground on the leaders. For Cavendish, returning to track racing after an eleven-month lay off has proved difficult, especially on the technically demanding 166m Kuipke track. ?I had two weeks off, but that?s not much after 105 days of racing,? Cavendish said. ?My fitness isn?t too bad, it?s my track form that?s the problem. 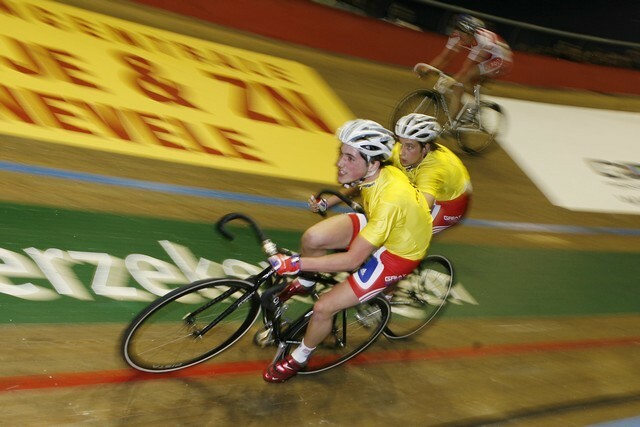 I haven?t raced on a track properly since Moscow [World Cup]. Bradley?s going really well and has been looking after me, doing double turns.? The British pair currently lie in 12th place, 19 laps down on the leaders Iljo Keisse and Robert Bartko. The order is dictated by the laps that a team gets during the two hour-long Madison races that take place. The shorter races throughout the evening allow the teams to build up their points total. While Wiggins and Cavendish aren?t losing laps, they are, according to British Cycling coach Rod Ellingworth, holding back and not going for laps, ?it?s not that they?re going out the back, it?s that all the other teams are taking laps,? he said. ?They can both ride in the wheels really well, and are working on technical things in the throws.? In the under-25 UIV cup the British paring of Peter Kennaugh and Adam Blythe lost the lead to the Belgium pairing of Davy Tuytens and Tosh Van der Sande who now lead by seven points. The leading four teams are all on the same lap, although the British and Belgian pairings are stretching away on points.